Wendy Corsi Staub has been terrifying readers with her psychological suspense novels throughout her long career. The author of over eighty novels, Wendy knows her way around a topical plotline and always manages to find something fresh to say on her subject matter. Blood Red, the first in a new trilogy, was recently released and her long-time fans are loving it, but hopefully readers unfamiliar with Wendy’s work will also give it a try, as they are sure to be left clamoring for more. 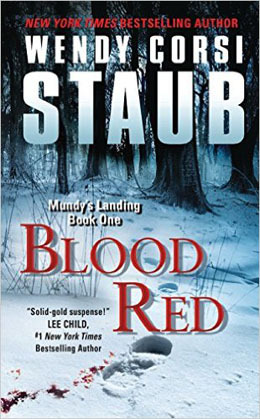 Blood Red is set in the fictional town of Mundy’s Landing, located in New York’s Hudson Valley. Fans of Lisa Unger’s books set in The Hollows will feel very much at home in Mundy’s Landing. It is a town with a small town feel, a long history, and dark secrets buried in its past. Since Mundy’s Landing is known for a horrific unsolved crime spree dating back to 1916 – the so-called Sleeping Beauty Murders because of the unique way the bodies are displayed – and an annual “festival” in which strangers travel into town in an attempt to solve this historical crime, Mundy’s Landing is able to avoid the “Cabot Cove” syndrome that is so common in series set within the same location. Thus, the crime at the center of Blood Red is solved within the pages of this novel, but it seems that the setting is going to be the bond between these books – likely with many of the townsfolk appearing to varying degrees in each novel. Blood Red is the story of Rowan Mundy. Rowan is married to Jake, a descendent of the town’s founding family, and as such is well known about town. Her youngest son, Mick, still lives at home, while her older children have moved away to start their adult lives elsewhere. All seems to be going well for Rowan until a mysterious package is delivered to her doorstep. Contained within are a dozen burnt cookies – a reference to a past transgression that only Rowan understands. At first, Rowan is convinced it is just a practical joke until red-haired women begin to go missing around Mundy’s Landing. Could her past finally be catching up to her? Set between Thanksgiving and Christmas 2015, readers can almost feel the chill of winter in Mundy’s Landing. The chills just continue to come as the crime wave escalates throughout town, eventually snagging Mick Mundy within its web. 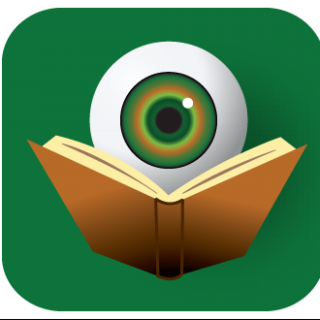 Chapters within the novel are separated by reprints of newspaper clippings from various years detailing town lore – everything from quirky anecdotes and profiles of eccentric citizens to tales of government corruption and impassioned letters to the editor. The further one reads, the more sense these pieces of ephemera begin to make. This was a well thought-out method of doling out archival information about the town to readers. Wendy Corsi Staub successfully mirrors the trials and tribulations of this one family with the horror and terrorization facing Mundy’s Landing at large, always leaving readers wondering how the two might be connected. Blood Red is a masterclass in how to successfully merge plot and location. Similar to the way in which Louise Penny has brought Three Pines to life, Wendy Corsi Staub has made Mundy’s Landing a character within the novel. No doubt this will continue to develop over the remainder of the trilogy. As the winter season approaches, Blood Red will be perfect for reading by the fireplace while sipping your favorite hot beverage. Start reading now, so you can join the chorus of folks begging Wendy Corsi Staub for the sequel. Blue Moon will be out next year.